After my failed attempt to visit San Gaggio, I decided it was time to turn to the church of Santo Spirito for my research on the Corsini family. In 1804 the tomb monuments, busts and cenotaphs of the Corsini had been moved from San Gaggio to this church, where the family had owned a chapel as well. In 1300 the Corsini Chapel (La Cappella dei Principi Corsini) was founded on the east-side of the second cloister of Santo Spirito, the so-called chiostro grande dell’Ammannati. As of 2007 this cloister has lost its religious function and it now belongs to a military institute. But although this cloister now holds a branch of the Esercito Italiano (the Italian army), the Corsini Chapel itself has not been turned into a military office and, luckily, is still intact. 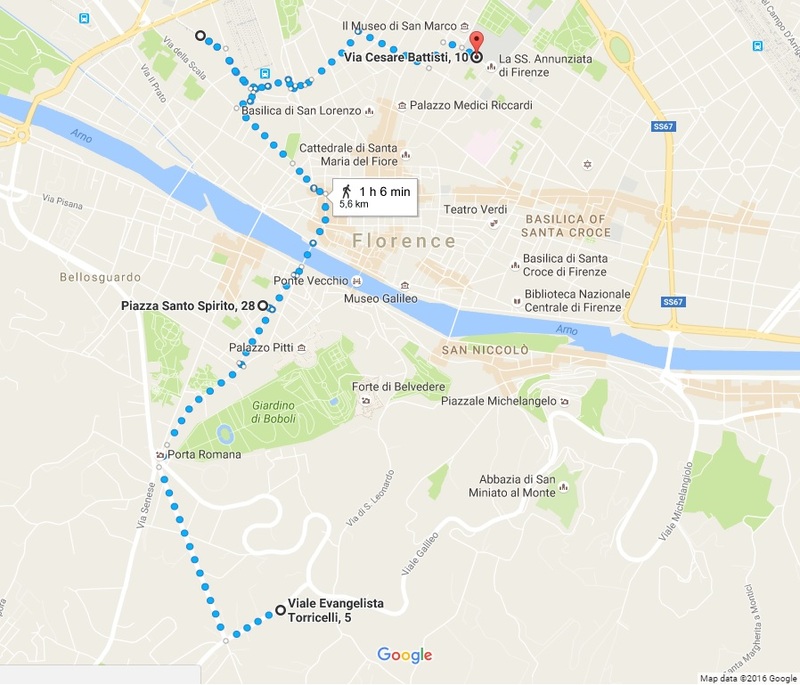 Therefore, I left the Dutch University Institute of Art History in good spirits on the day of my second excursion, confident and eager to finally see some Corsini monuments. Seeing as I had spent the last days studying in the library, bent over books and barely moving, I decided to walk all the way down the hill to the church. At the door of the cloister, one of the military employees told me I would need permission and a special pass if I wished to visit the Cappella Corsini. The formal letter I had brought with me, explaining that my visit was for research purposes, did not suffice. 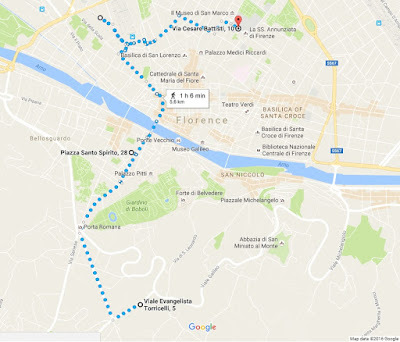 I could obtain this special pass, he explained, at the Istituto Geografico Militare near Santa Maria Novella. “Very well!” I said, and on I walked. Having misinterpreted the directions that were given me, it was more than half an hour later that I arrived at this military institute, slightly out of breath, but glad to have arrived. I patiently explained my wish to visit the Corsini Chapel in Santo Spirito. Doubtful as to whether they could help me, but making several phone calls to be sure, they were finally forced to tell me that I was indeed in need of special authorisation, but that this was not the location to obtain it: I had to go to another military institute, near San Marco. “Very well!” I said, and on I walked. This time, my by now somewhat sore feet carried me to my destination in a mere twenty minutes. At the reception of the Istituto Geografico Militare near San Marco they asked me with great surprise why on earth I had come all the way to San Marco to ask for permission, and kindly suggested that I ask at the institute of Santo Spirito. After all, it was their cloister I wished to visit. Having all morning been sent from one military institute to the next, and having by now been walking for more than an hour in total and still not having reached my destination, I couldn’t hold back my desperate laughter. Luckily, the man at the desk sympathised with me, he made some phone calls and told me to wait. After a few minutes of waiting in the hallway of the institute, the man told me to leave my identity card at the reception and to follow him inside. He led me past an inner square and corridors with old-fashioned geographical measuring instruments into an office, where two men in green uniforms looked up from their conversation at a desk. The man from the reception introduced me to the men in green, a major and a colonel, who patiently listened to my plea. The colonel nodded and picked up the phone to organize authorisation to visit the cloister. After the call, he explained that I would be contacted the next day to fix an appointment for my visit. Gratefully I said goodbye, and leaving the institute walked straight to the bus, instead of all the way home. The next morning the Esercito of Santo Spirito telephoned to inform me that I had full authorisation from the colonel to visit the chapel for my research purposes, and that I could pass by whenever I wanted. There was only one small problem, the receptionist added. In preparation for my visit, they had wished to open the chapel, which had been closed up for a long time – but when they applied the key to the door, the fifteenth-century key had broken off in the lock… keeping the Corsini treasures under lock and key, and postponing my visit yet again.